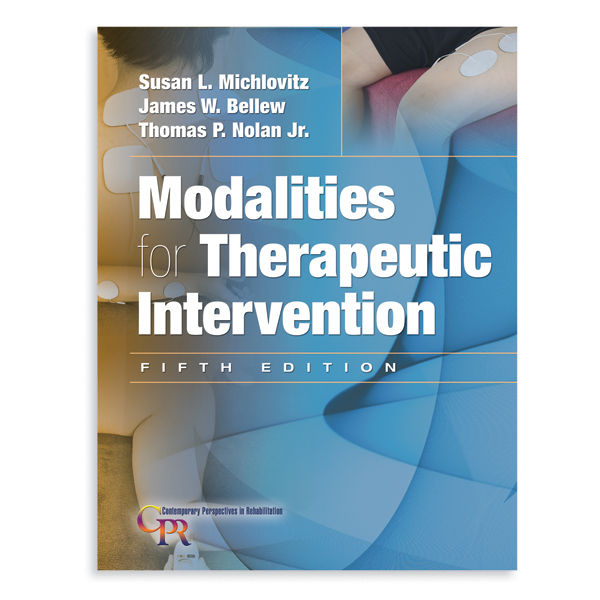 The most current and concise text on therapeutic modalities in a case-based format. The fifth edition's focus remains on expanding and strengthening clinical decision-making skills through question driven case studies. A problem-solving approach of the contemporary application of modalities emphasizing on evidence-based practice is presented. The terminology of the APTA's Guide to Physical Therapist Practice is used. Sections include pain, tissue healing and edema, muscle weakness and loss of motor performance. Modalities covered are cold therapy, thermotherapy, therapeutic ultrasound and phonophoresis, several chapters on electrotherapy and iontophoresis, hydrotherapy, electromagnetic radiation, including laser and mechanical modalities. Hard cover, 460 pages, 325 illustrations. By Susan Michlovitz, PT, PhD, CHT, Thomas P. Nolan, Jr., PT DPT, OCS and James W. Bellew, PT, EdD. 5th edition, copyright 2011.